Most casual web developers (and a fair number of professional developers) use JPEG or GIF images on the web, but there is another contender out there: PNG, which stands for Portable Network Graphics. Probably the most exciting part about PNG files is that they support full alpha transparency. What does this mean? 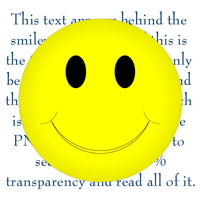 Well, with a GIF image, you can knock out a specific color and have transparency. With a PNG image you can do that, plus you can choose to have elements be semi-transparent. This is obviously a huge boost to web design, but the problem, as is often the case, is Internet Explorer. Prior to IE7, IE did not support alpha transparency. You could use PNG images and get all the other perks, but it would substitute a light grayish color in place of your transparency. Every other major browser from the last few years could handle PNG alpha transparency, but unless you wanted to have duplicate versions of your site, one with PNGs and a simpler version of the design with GIFs for IE, most developers avoided PNG images. However, there has been a solution under our noses the whole time that I recently discovered: AlphaImageLoader Filter. Basically, this little bit of faux-CSS coding loads the filter and processes the image before displaying it. Note that you must specify a height and width for the area that the image will fill (this is known in CSS as a "bounding box"). However, if you always write valid code, you will have included this information already. Overall, PNG images are the way to go, and as we move farther and farther into faster loading web sites that need to look just as slick as print media, you’ll find that PNG images can fulfill those needs. And now that you’re equipped with this little trick, your your new designs will be supported by all the modern browsers. Check out the official documentation about the AlphaImageLoader filter from Microsoft’s site. You can also add background colour to PNG image files that will gracefully degrade in IE6 and lower versions using TweakPNG. Great article, thanks for the tip. Usually IE hacks can be a pain, but this is fairly clean and simple. That is so cool. I’m bookmarking this for future reference. Good tips, nothing new but something defiantly you need to keep an eye on. I simply cannot wait until IE6 disappears for good..
PNG is not new. It is a graphic format from about 1995 that never quite caught on, and for good reason. Besides the IE problem, it is harder to work with than either jpg or gif. Using PhotoShop it is very difficult to make a png small enough to be viable. I want my pages to load as fast as possible, and png does not optimize as well/easy as the other two formats. This may be possible, but be prepared for a lot of learning and added work. I can make a good sharp jpg that is quite small. And a gif is small by default because you can only use 256 colors with it at most. 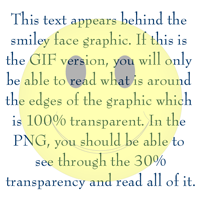 Look around the web and see how many png pics you find. Not many I at all. I don’t think after all this time it will ever become a default format. I think that all the file formats have a specific usage. Photos tend to get compressed more easily with JPGs, while buttons and simple graphics are good in GIF. PNG behaves similarly to GIFs from my past experience, and sometimes they are preferred because they support more colors. I am not sure if we’ll see one of these formats becoming the standard in the future. Perhaps there is still room for something innovative that solves all the problems?